Your details are secure and confidential and will never be exchanged with third parties. Andrea has a genuine warmth and enthusiasm for people and life a modern day Spiritual Teacher. 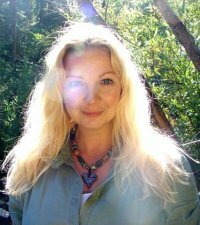 A natural communicator and Intuitive Visionary, she has a unique ability to connect with people from all walks of life, countries, religions and cultures and is a Catalyst for Positive Change in reclaiming your Authentic Power. In 2000 without seeking it Andrea experienced an amazing spiritual awakening & transformation, working with her Higher-Self / Authentic Self, which changed her life. This awakening gave her no option but to live and speak her highest truth, bestowing upon her a gateway to intuitive and transformative knowledge and wisdoms. Awakening the ability to read the EMOTIONAL AKASHIC SOUL RECORDS. Past Lives, Inner Child, Ancestral Lineages and Sense Entities. She also speaks SOUL LIGHT LANGUAGE CODES and TRANSMISSIONS to assist other souls in their own awakening to SELF LOVE, beyond DIS- EASE to live in the NOW. The path of 'the heart' has allowed her to become a spiritual teacher for the 21st century, dispelling the outmoded and often inaccurate image of someone who works in these fields! Her style is fun, amusing, deep, thought provoking and a breath of fresh air in the mind, body and spirit field. She has great passion for knowledge on the esoteric world, metaphysics , parapsychology and evolving consciousness. Her work involves helping those souls who are ready to journey within and heal the inner self, which transforms everything - empowering people back to themselves and reaching their true hu-man potential. She was born in Stoke -on -Trent, England on 22nd May, for those interested in numerology. Andrea spent her childhood in Cheshire, and currently lives in Avalon, Glastonbury & Cornwall. She has spent a great deal of her time traveling to sacred sites in the world, and meeting with amazing souls. She likes to spend a few months a year in Sedona, Arizona and Hawaiian Islands. Please see events diary for location at current time. Andrea is avaliable for phone/skype sessions from any location in the world, to assit you in the NOW. Initially Andrea worked giving channeled soul readings , energy healing connecting with (starbeings multi dimensional) realms. Psychometry was one of her first tools in her metaphysical tool box. During these years, she became aware of connecting with her clients past lives, Ancestral Lineages, Wounded Inner Child from Womb - Present day, Entities ( earth bound spirits or inter dimensional entities). It is much more beneficial for the client to experience and heal the past lives for themselves. She then decided to study become a qualified Past Life, Inner Child and Spirit Releasement therapist. Although qualified in these fields most of her knowledge has come through her own Past life cell memories, the Cosmic University of Life , connection to source and her Soul Star families, including a vast wealth of experience from regressing thousands of clients in this lifetime in over 22,000+ hours and 17 years. Andrea 1st appeared on UK television talking about the esoteric world on the BBC1’s “Kilroy Show” in 2003. In 2004 UK television's flagship show on ITV1” This Morning” heard about her work and invited her to regress the show hosts Fern Britton & Philip Schofield. Such was the success of that one appearance, with astounding results of the show’s presenters’ past lives, the producers asked her to return as the” Resident Past life Regression Expert” on the show. For the next year on “This Morning” she regressed celebrities and members of the public back in time, which enabled her to show that closure on negative cell memory to past lives, can positively improve your present life. ITV1 then commissioned and aired from 2005- 2007 a dedicated show for Andrea called “Have I Been Here Before?” hosted by Philip Schofield with Andrea regressing the celebrities back in time. Jules Hudson the historian then investigated the historical accuracy of those Past lives, with fascinating results. This show allows the viewers an insight into past lives. It does not focus on the healing aspects, more the concept of reincarnation. Since then Andrea has appeared on various other television programmes, radio, press in relation to spiritual aspects of life, health, well-being and evolving consciousness through living in her heart ,working with the " Illuminated Beings of Light" from various star systems. She holds, talks, workshops all over the world. Please contact the office if you would to arrange Andrea to run a workshop in your community or country. Join Andrea's online newsletter and receive information on guest appearances, seminars, workshops and all the latest news, sprinkled with love light and twinkles! "Earth Peace Meditation & 10 Minute Daily Meditation"
Site content © 2000-2019 Andrea Foulkes. All rights reserved.